Adjust the brakes on any bicycle is a tedious process only sped up by experience. We will go over several steps that can help improve that process for you and get you riding quicker. Ensure the caliper mount bolts are tight. There are 4 bolts that hold the caliper onto the bike. 2 that bolt the caliper mount to the frame, and 2 that bolt the caliper to the mount. Ensure that the two that mount to the frame are reasonably tight. You dont have to go crazy and crack the paint. Sight through the top of the brake caliper to check for rotor clearance. You cant look through the center of the caliper, it has to be from the top on the front brake, and the top back on the rear. We are trying to identify how the caliper is orientated in regards to the rotor. Try loosening the caliper to mount arm bolts 1 turn, and adjusting the caliper in regards to the rotor. If the caliper wont move, loosen a bit more. You are looking to barely be able to move the caliper, not to be totally free floating. When you adjust the caliper, aim to have equal clearance between the pad and rotor on both sides. Tighten the caliper 1/4 a turn while trying to maintain the adjustment. We try to keep the brakes simple without concave washers for a firm mount that shouldnt come out of adjustment under use. If you find that you can get some clearance on both sides, but the pad is not parallel to the rotor, you can bend the caliper mount arm to adjust the angle of the pads. To bend the caliper mount we place a crescent wrench on the black portion below the brake itself. Using the crescent we tweak the arm slightly, just enough to get the pads more parallel to the rotor. Continue to adjust the caliper until you have an even gap on both sides between the pads. 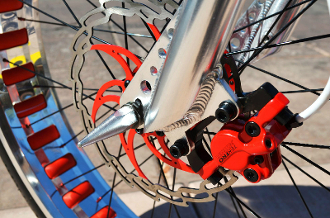 On Tektro hydraulic brakes there is no manual adjustment of the pads. You can adjust the lever throw at the lever itself, it is a small 1.5mm allen that is from the inside of the lever to the plunger.